The monastery of Kallergis or Kaleris is located near the village of Smari, south of the peak of mount Voukolies, about 28km east of Heraklion and 5km north west of Kastelli. It is dedicated to Agios Ioannis o Prodromos (St. John the Baptist) and was built one hundred years ago, although there are remains of monk cells on the Voukolies mount, testifying the existence of a much older monastery. It belonged to an Ottoman woman who sold it to the abbot of Vidiani monastery, Methodios Perakis, in 1884. 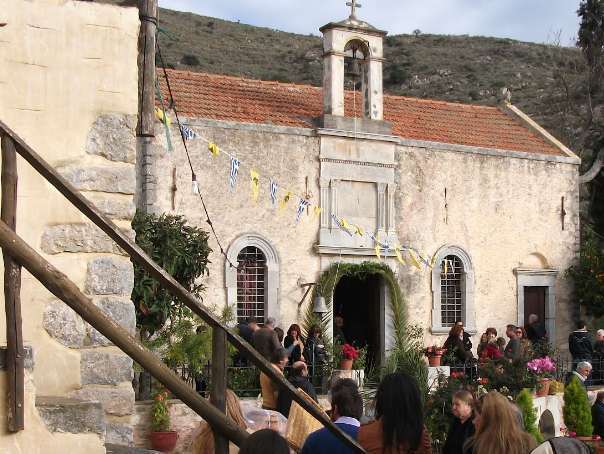 The church of Agios Ioannis was renovated in 1912, according to the inscription on the belfry. It was abandoned for many decades when a fire burnt down a considerable amount of olive trees, in 1931. Nowadays, the ancient church is in fair condition and the main building has been restored, with the vaulted south-west part turned into a refectory. There is also a newer two-aisled church nearby, dedicated to St. George and St. Spyridon. The monastery is restored by the “Friends of the Monastery Kalergis Associaton”.